Forbes is an American business magazine owned by Forbes, Inc. Published biweekly, it features original articles on finance, industry, investing, and marketing topics. Forbes also reports on related subjects such as technology, communications, science, and law. Its headquarters are inNew York City. The magazine is well known for its lists and rankings, including its lists of the richest, most powerful etc.,… wonder who this horsewoman is ? All eyes perhaps were on the glamorous gowns on the Oscar's red carpet, but the real bang was somewhat different ! Pop star Lady Gaga, 29, and Priyanka Chopra, 33, were wearing enough impressive jewels to buy a small suburban neighborhood as they hit the red carpet on Sunday at the 88th Annual Academy Awards. Whatever they did, and whosoever followed them – Bill Gates topped the list of the world’s richest billionaires for the 17th time in 22 years, it has been revealed. Though the 60-year-old Microsoft head is $4.2billion poorer than 2015, his net worth of $75billion has put him in the top spot of the spot on Forbes' World Billionaires list for the third year in a row, after overcoming Mexico’s Carlos Slim Helu in 2014. Helu came in fourth in Forbes’ 2016 list, behind Gates, Zara’s Amancio Ortega and business mogul Warren Buffett, respectively. A horse rider from Norway has become the world's youngest billionaire after amassing a $1.2billion fortune at the age of just 19. 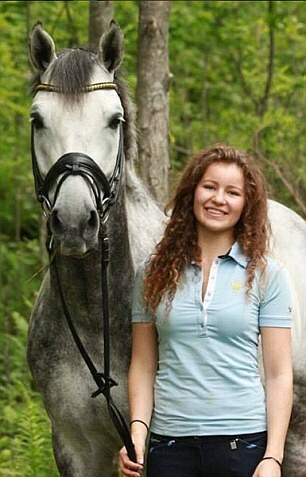 Forbes magazine has named Alexandra Andresen, a professional dressage competitor, on their list of all people around the world worth at least one billion dollars. It is the first time the teenager and her sister Katharina, aged 20, have appeared on the list and they are ranked as the 1,475th richest people in the world. Miss Andresen, a professional horse rider, accumulated her personal fortune after her father Johan F. Andresen transferred his stake in Norway's biggest company, Ferd Holdings, to his daughters in 2007. Her family had made a fortune in the tobacco industry and her great, great, great grandfather founded Norway's biggest cigarette producer. The company was sold for $500million in 2005 and the money then invested in property and hedge funds. Two years later her father gave 80 per cent of his shares in the company Ferd Holdings to Miss Andresen and her sister. The sisters made the list this year for the first time as they both now are above 17 and a required to publish their tax returns, meaning their personal fortunes were made public. But despite her incredible personal wealth, Miss Andresen appears to be more at home with her horses and lives in Germany where she rides professionally. She has won several accolades on her horse Belamour at the European Junior Riders Championships. Her boyfriend is said to be Joachim Tollefsen, 24, a professional mixed martial arts fighter, also from Norway. In an interview on her company website, she talked about her family wealth but said it was not enough to just have money to succeed. As well as Miss Andresen and her sister making the list, the third youngest billionaire is Gustav Magnar Witzoe, another Norwegian. Away, in UK, a millionaire philanthropist allegedly sped off with a police officer hanging from his Jaguar in a 'water skiing position' after he was pulled over for driving too fast, a court has heard. Textile tycoon Sir Harry Djanogly, 77, allegedly 'revved off' along the dual carriageway as Sergeant Robert McDonald desperately clung onto the car's steering wheel 'in fear of his life'. The policeman was then pulled 50 yards along the road before the policeman's weight on the steering wheel forced the vehicle to career into oncoming traffic. The incident came after Sir Harry, father of Huntingdon Tory MP Jonathan Djanogly, was stopped on the A40 in Hammersmith, west London, after allegedly weaving in and out of traffic at 70mph. After the policeman approached the millionaire's car and told him he was under arrest, Djanogly alleged claimed his wife had breathing difficulties and raced off, while Sergeant McDonald was still hanging on. He eventually came to a stop 50 yards along the road, leaving the sergeant emotionally scarred from the incident, the court was told. Sir Harry, who has an estimated personal fortune of £300 million and is believed to own the world's largest collection of work by artist LS Lowry, is now standing trial, accused of dangerous driving and assault. The prosecution intend to argue the circumstances of this incident that action of the defendant driving away also constituted an assault on that police officer.Djanogly denies the charges, saying the movement of the car had been accidental and that the officer had been aggressive towards him. The philanthropist, who lives in a £1m three-bedroom maisonette in central London, fled Nazi Germany with his family in 1936 and started-out as a supplier of stockings and hosiery in Nottingham. The Djanogly Foundation is a registered as a charity, donating millions to arts and education. The trial is on. Back home, in Jan 2016 a Kerala Court sentenced a tobacco magnate to life for killing a security guard with his luxury SUV. The convict, Mohammed Nisham, was found guilty of murder by the Thrissur district additional sessions court. Rejecting the prosecution’s demand for death penalty, the court also imposed a Rs 70-lakh fine on the businessman -- Rs 50 lakh of which would be given to the widow of the deceased guard, Chandra Bose. Sources however, stated that Nisham won’t be getting off easy with the life term, which runs for 14 years, because he would have to spend 24 additional years behind bars under eight sections other than murder in the case. This means that the 39-year-old businessman would have to spend the next 38 years of his life in prison. politics of statue ~ Thiruvalluvar in news ! Rhinochill ~ could humans hibernate too ? WC T20 2016 - India starts with a bang ! How short a T20 International can be ?